We all get a little cough sometimes and usually don’t think much of it. But how do you know when a cough could be something more serious? There are a few warning signs to look for. If a cough is accompanied by any of the following things, you should see a medical professional. This is usually a telltale sign of asthma, especially if it worsens while exercising and causes a shortness of breath. Allergies or a cold can cause mucus to drip down your throat when you lay down, which tickles your nerve endings and triggers a cough. A cough that is very dry, painful and comes in violent bursts can be GERD, or gastroesophageal reflux disease. This type of cough is triggered by stomach acid that gets backed up into your airways. This cough, particularly when it’s worse in the mornings and gets better throughout the day, could be a sign of COPD (chronic obstructive pulmonary disease). This category of disease includes bronchitis and emphysema. A cough that is dry for a few days but then turns into a wetter cough producing mucus could be a sign of pneumonia. A fever, chills, and pain or difficulty breathing are also common . Because a cough can be a symptom of many things, it can be hard to determine its root cause. Let the medical professionals at FastMed examine your cough and treat it accordingly. 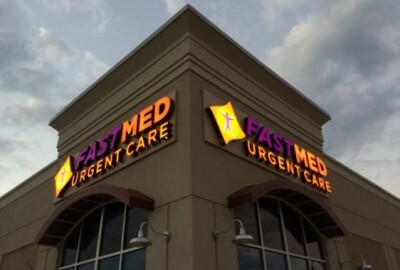 FastMed is a network of urgent cares throughout North Carolina, Arizona, and Texas that is open seven days a week and never requires an appointment. We also accept most major insurance,, including Medicaid and Medicare. Find a FastMed near you today!